What may be the first-ever tattoo-themed North American cruise, Ink or Swim, will sail April 16 – 20, 2015 from Fort Lauderdale to Cozumel, Mexico on Royal Caribbean’s Liberty of the Seas®. Produced by REBEL INK, the popular magazine highlighting tattoo lifestyle and ink culture, and award-winning photographer Dan Howell, the first annual cruise will offer guests the exclusive opportunity to sail the high seas while getting ‘fresh ink’ from some of the most in-demand artists in the country, as well attend exclusive Ink or Swim events including onboard Burlesque shows, tattoo contests, complimentary photo shoots and a private beach party in Cozumel. An impressive roster of tattoo artists will anchor the cruise at Tattoo Alley, an onboard body art showcase and inking experience. Artists already confirmed include: Tatu Baby, voted as one of the world’s sexiest and talented artists and a fan favorite of Spike TV’s “Ink Master”; Sarah Miller, the award-winning owner of famed Wyld Child Tattoo Shop in Pittsburgh, PA and known for her realism style body art; Mark Longenecker, an avid surfer and philanthropist and owner of Endless Summer Tattoo in Cocoa Beach, FL; Amy Nicoletto, the gothic princess of the tattoo world and overnight sensation opposite Kat Von D on “LA Ink”; and Chris Torres, the bad boy of the tattoo industry known for his renowned old-school style and recently opened tat shop, Red Legged Devils in Brooklyn, NY. Bookable online via the Ink or Swim website, rates begin at $970 per person, based on double occupancy and include all Ink or Swim activities, amenities and exclusive events, as well a $100 credit toward an onboard tattoo for the 1st and 2nd guests in each room. 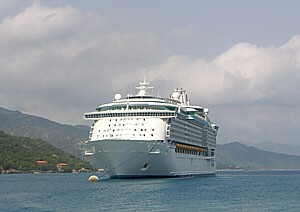 In addition to the Ink or Swim experience, rates will also offer guests four nights aboard Royal Caribbean’s recently renovated Liberty of the Seas and access to its 10 restaurants, cafes and lounges, 10 pools and whirlpools including FlowRider® surf simulator, Broadway-style musicals, a Vegas-style casino and complimentary ice shows throughout the cruise. For more information, visit www.inkorswimtattoocruise.com.